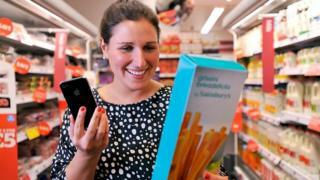 Supermarket giant Sainsbury's is to close its mobile phone service after two years, the company has confirmed. Mobile by Sainsbury's was a "virtual network" run on infrastructure provided by Vodafone. The BBC understands the two companies could not reach an agreement to continue the service, which will close on 15 January. Sainsbury's told the BBC it still wanted to provide a mobile service to shoppers and was exploring its options. Brands such as Giffgaff, TalkTalk and Tesco Mobile are known as mobile virtual network operators (MVNO) and run on infrastructure provided by other carriers, including O2, Three and EE. Sainsbury's rival Tesco Mobile is one of the largest MVNO in the UK and has about four million subscribers. Mobile by Sainsbury's attracted just 150,000 subscribers, which the BBC understands did not meet Vodafone's expectations. Sainsbury's told the BBC it was exploring other options and was "still interested" in providing a mobile network for its customers. In July, TalkTalk suggested Vodafone was leaving the MVNO market, in documents submitted to the Competition and Markets Authority. Vodafone denied the suggestion and said it continued to operate MVNO with companies such as Amazon, Lebara and Talk Mobile. Sainsbury's said its customers would be able to move their numbers to a new network if they wanted to, and the supermarket chain would continue to sell mobile phones in more than 300 of its stores.